Jet setting DJ James Holroyd touches down at to the Trades headlining another top quality Into the Valley club night on Saturday 12th September. James is no stranger to the valley as he played some memorable sets at yesteryear’s Boogiejuice night but he made his name at legendary Leeds club night BacktoBasics and sell out sets at Manchester’s Bugged Out! Since then James has taken his deep beats to clubs across the world including legendary gigs in Chicago, New York and Detroit cementing an international reputation as one of the most consistent jocks this country has ever produced. 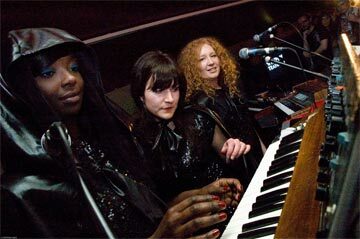 Live support comes from caped girl group the Sisters of Transistors who used a research grant from the Ferranti Institute to create a band dedicated to celebrating the glory of the electric organ. The quartet use fully restored combo organs from across the globe to whip up a sonic storm tracing the history of the instrument from its early days entertaining the troops at US air force bases across England in World War Two to the glory days of Madchester rave. If that wasn’t enough residents Chris Atkins from Paperrecordings and local DJ Chris Price from What the Freak are on the decks with some classic house and acid house. The weekend kicks of with a welcome return of the Hello Sailor burlesque team on Friday September 11th recreating the Weimer Republic decadence of the KitKat club in Hebden Bridge. Hello Sailor has once again recruited some of the best Burlesque artists across the North of England with the cheeky Nellie Plum and Twinkles Fortuna among those shaking their tail feathers for the delectation of the audience. “This might only be the third Into the Valley but yet again they've pulled together another guaranteed sell out bill with the legendary James Holroyd on the decks and the surreally brilliant Sisters of Transistors performing a rare live set outside Manchester,” Trades Club spokesperson Paul Clarke told the Hebden Bridge Web.